This painting forms one of a set of six views of the Piazza San Marco and the Piazzetta, at the heart of Venice. The series may have been Canaletto’s earliest commission from Joseph Smith, British Consul in Venice, who sold his outstanding group of paintings, prints and drawings by the artist to George III in 1762. The set is all of the same size and, judging from the compositions and broad handling of paint, was probably intended to be incorporated symmetrically into the decoration of a single Venetian room. 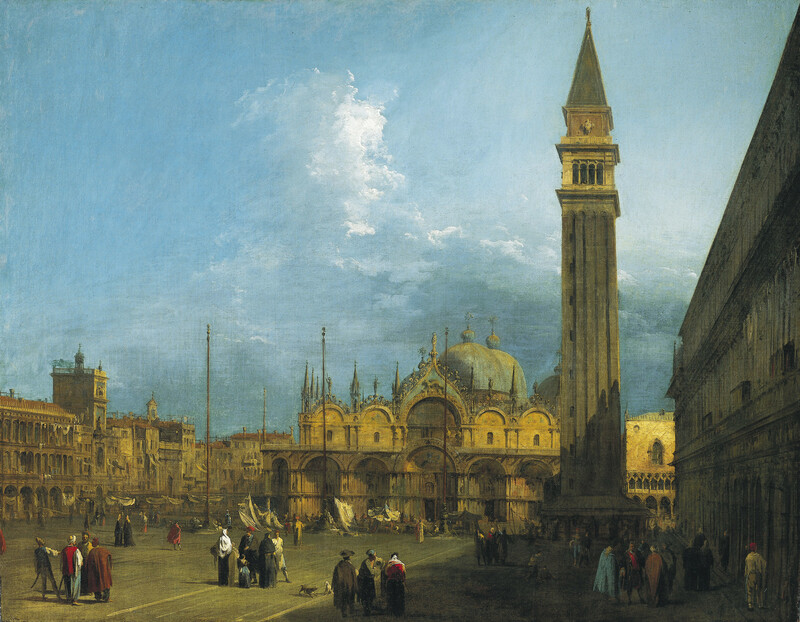 Four of the views are upright in format while this painting and its pendant (RCIN 405935) are horizontal; the pendant shows the opposite view of Piazza San Marco, looking west, in morning as opposed to evening light. A closely related preparatory drawing for each view (also in the Royal Collection) may have been the basis for discussion between artist and patron. The care taken over the composition of the architecture and the changes made during the course of painting suggest that the balance and effect of the whole was important to both of them. Canaletto's training as a painter of theatrical scenery can be recognised in the creation of a clearly defined architectural space in subdued colours, animated by the brightly coloured figures and temporary booths. A ruling instrument was used for the Campanile and Procuratie Nuove and dividers for the arches on the façade of the Basilica. The late afternoon light brilliantly highlights the Palazzo Ducale, in contrast to the Procuratie Nuove, whose diagonal shadow throws the lower part of the Campanile and part of the Piazza into darkness, catching two strategically placed groups of bystanders in half-shadow. The striking contrasts of light, the expansive skies with swirling clouds, the emphasis on diagonals, and the broad fluid strokes defining the figures have been compared to those in The Stonemason's Yard (London, National Gallery) painted before August 1725 and the series of four paintings commissioned by Stefano Conti (private collection) dated 1725-6. The paintings appear to have arrived in London unframed; if so, this would strengthen the suggestion that they had been set into a room in one of Smith’s houses in Italy. George III framed them in English ‘Maratta’ frames and hung them in the Entrance Hall of Buckingham House. When Horace Walpole saw them, he described them as ‘bolder, stronger & far superior to his [Canaletto’s] common Works’.